No one downloads mobile apps anymore! I've just had this 'I said so' moment. While everyone uses mobile smartphone and apps are an integral part of the mobile ecosystem, it looks like more and more people are 'done' with the apps. The latest ( 2017 ) report by comScore claims that people have already installed the apps they want and there's a lesser chance that they'll install a new app. 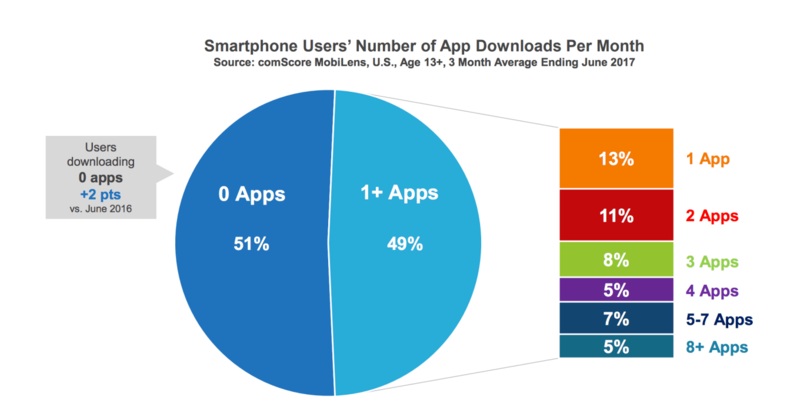 In fact, the 51% of the mobile users do not download any apps in a month! Average user downloads just two. The report also says that users have more engagement with the apps they've already installed, but the the reach of mobile web is almost 2x that of the apps. How many apps do you download every month? The last app I downloaded was Twitter; and I did that last year.  What about you? Never. Removing what came preinstalled. Prefer desktops, less laptops, and rarely tablets. Mobile is mostly to receive calls, make them, get messages, and send them. Last installed app on my Windows Phone: myTube, a paid YouTube third party app which was available for free during a sale. The reason for not installing new apps lies with the fact that every other Android app irrespective of functionality forces you to install the app on the internal storage. Most people have smartphones with 8GB or 16GB of storage and the OS and preinstalled apps take up more than half of the space and if you want to install any apps you are forced to install them on internal storage. While this problem has been partially addressed by Android since Marshmallow where it allows you to adopt a microSD card as internal storage, brands like Samsung forbid this procedure. PS: @Anand Nagda Finally, nice to see a Windows Phone user on CE. I too own the Nokia Lumia 730. In which I might point out very very few apps nearly 1% require your internal storage for installation. @Satya Swaroop Dash - A thing to note is that the report is based on the US users; who, I believe do have capable smartphones with better storages. I could be wrong; but it's just a possibility. In the Indian context, what you say is absolutely true. Most people have 'basic' smartphones with ~8-16 GB of storage and most of it is occupied by selfies and photos and maybe whatsapp forwarded videos. There's no room for more apps to be tried. I do own a capable phone; but I seldom install any new apps 'just to try' it and have never made any purchase on the Play Store. thanks satya swaroop. and finally i am going to own jiophone & nokia 6 within future..